Lavender means a lot for us here on the farm. I am the housekeeper but I help out with the lavender when I have to, and I sell for Annemarie at the shows. 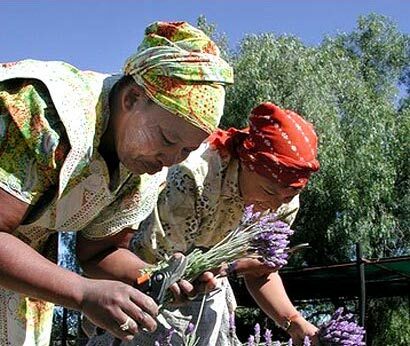 You know lavender is very good medicine; it helps stress and wounds. We laughed at first when we heard Miss Annemarie was planting lavender. People in the town thought we were mad here. But lavender is not a simple flower. Now lavender gives us all a broad smile. Before this, we were desperate and wondered what to do. Now I see a wonderful future. Lavender is something special for me. I had no work. I was very bored sitting at home. Then I came to work in the house. Every day, after I’m finished with the housework, I come to pot the plants. And I talk to them. They answer me by growing so well. They’re all so special – the English, the French, the Spanish . . . I grew up on this farm but I was always in a corner - I had trouble with other people... Now I’m at my happiest when working with the flowers. My job is to pick flowers early in the morning and then, when it gets too hot, to work in the lavender room. Picking is my best time and I can pick very fast. The only problem is if you pick the wrong stem. my heart is very sore for cutting the wrong stem. But lavender really changed things for us here by providing work for the youngsters. You know, I see lavender in my dreams at night!